Every single storage space, regardless of the size, has a drive-up accessible roll-up door. This means that you will never have to lug your goods down long narrow hallways or up stairways and freight elevators. Just pull up to your door, roll it up, unload, roll it down, and go. It’s that easy! Our managers love helping people and understand the stress that moving places on individuals. Our managers will do everything they can to assist you from the very moment you first contact us. 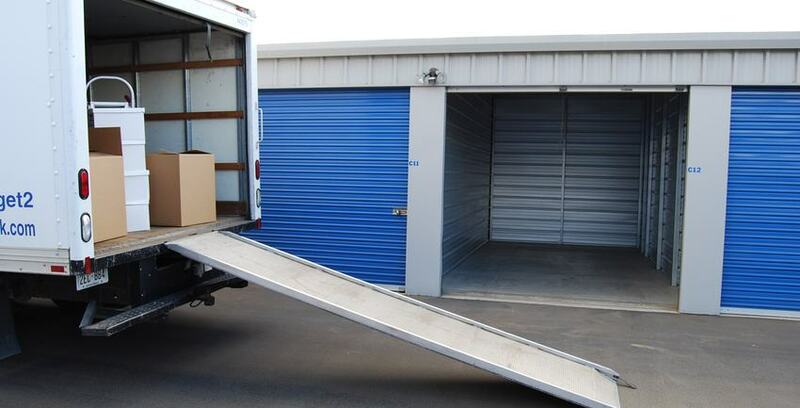 They can help you determine what storage space size you need and can even give you money saving ideas when it comes to storing your goods. Each storage space has its own burglar alarm, and you get your own individual code. If someone tries to access your storage space without entering in your individual code, the alarms will sound. This is just another great feature to help ensure that your items remain right where you left them. Fortress-Secure Mini-Storage uses a special system called Protectowire Linear Heat Detection. If a fire were to start in a storage space, the system automatically calls the fire department and alerts them to the exact location of the fire. We are proud to have this system in place, offering you the peace of mind you deserve. When you rent a storage space you will be provided with an individual burglar alarm code that also doubles as your individual gate access code. Simply type your code into the gate control panel. The gate will automatically open, and your burglar alarm will deactivate. For your convenience, our gates operate 365 days a year. This means that you can access your belongings on holidays and after the business office closes (see gate hours listed on facility home page). Although our managers keep a very close watch on things, it is helpful to have several extra sets of eyes. That is why Fortress-Secure Mini-Storage uses 24-Hour Video and Digital Video Recorders to help monitor security. Our cameras and digital recorders produce clear images that help ensure the security of your stored property and give you extra peace of mind. Our standby backup generator is always ready in case of a power outage. Customers won’t be denied access or locked behind our gate if the power goes out. Our generator is so large that it can power the entire facility, so all lights and systems remain on during an outage, which gives our facility an extra layer of security. Our storage spaces have up to 10 foot high ceilings that give our storage spaces 25% more volume than many of our competitors. Couches and mattresses can be placed on their ends, and light boxes can be stacked on top of them in order to utilize the space. Many of our customers have saved hundreds of dollars by taking advantage of our extra high ceilings. Solar power provides clean energy from the sun, and Fortress-Secure Mini-Storage in Santa Maria and Arroyo Grande has a large solar system that offsets a majority, if not all, of its electricity usage. Not only does this reduce the facility’s operating cost, but it’s also good for the environment. Fortress-Secure Mini-Storage has extensive lighting to help aid you during evening hours and add yet another level of security. LED lighting is provided in the drive aisles, and we even have lights in all our storage spaces that are 10’ by 15’ and larger. Our 10' by 10' and larger storage spaces have up to 8’ high by 8’8” wide roll up doors. Large roll-up doors make it easier to access your stored belongings. They can also make it much easier when parking a vehicle inside of a storage space. Extra wide aisles are wonderful because they allow customers to park in front of their storage spaces and still allow room for other customers to simply drive around them. Also, the main aisles at our facilities can accommodate the largest moving trucks allowed on California’s highways. For your convenience, Fortress-Secure Mini-Storage in Santa Maria, is an authorized U-Haul Neighborhood Dealer. Why drive across town to rent a truck when you can rent directly from us? We make the truck rental process easy and convenient. If you're like most people, you're short on helping hands when it comes time to move. Feel free to use our hand trucks to help you move your belongings. You can even make arrangements with the manager to take it off the facility grounds. Upon request, we will gladly accept most types of deliveries. Please see the manager for more details. We carry a wide assortment of packing and moving supplies at very competitive prices. From bubble wrap to large moving boxes, we have it all. If there is a packing supply product that we don’t have in stock, we can order it for you. Our manager can help you determine the items you will need, so please stop by anytime during office hours. What does Fortress-Secure Mini-Storage do?